Round. Pink. Cute. Named after a brand of vacuum cleaners. Kirby has a lot going for him, but in his very first adventure which came out in 1992 on the Game Boy, he had a little less going for him than what people are used to. But to judge Kirby's Dream Land on what it does not have instead of what it has would be doing it a disservice, and missing the little blob's first journey would be a mistake for anyone calling himself a Kirby fan. he cannot fill the hollow inside. Unlike in his later adventures, Kirby cannot run. He cannot slide. And most importantly, he cannot copy enemy abilities. All of these things would come less than a year later in the NES game Kirby's Adventure. That said, when you take Kirby's Dream Land for what it is instead of what it would become, it's hard not to be impressed by what IS there: the character's charming animations (I love seeing Kirby land face-first after a long fall), a vast majority of our favorite foes (Waddle Dee! Sir Kibble!) and really, really tight level design. In fact, Kirby's ability to float seem to make more sense than ever in this game. With his offensive abilities stunted and the smallness of the Game Boy screen, avoiding enemy encounters is not always an option. The game is very easy (at least the main quest is), but thanks to the character's abilities and the level design matching each other perfectly, it remains satisfying and fun to play. And your victims, little guy? Do they live on inside of you? Do their voices make you feel less alone? The game is incredibly short, with only 4 levels (plus a boss gauntlet at the end) to go through in less than an hour. There is a hard mode that you can unlock which makes the enemies in the game a LOT more aggressive, but despite the fact that I had to use many continues to go through it, it was still over very quickly. But there is more to a video game than the sheer amount of stuff it contains. Yes, it is short; and yes, Kirby lacks some of the abilities that would come to define him, but every second spent playing KDL is a fun-filled one. There is always an enemy to kill or a platform to jump on, there is always excitement. The game feels dense. 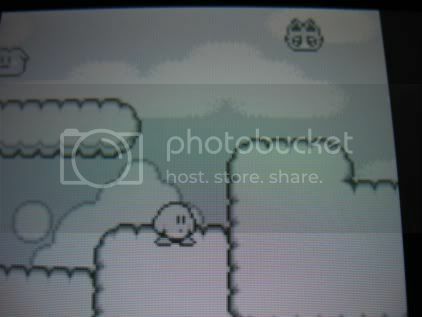 Kirby's Dream Land 3 may technically have had more: it had puzzles, it had tons of abilities and it had a quest that lasts a dozen hour instead of just one or two. But there was a lot of tediousness in that adventure, something that cannot be said of the first KDL. You may actually want to replay this one. It is easy to look at how "little" Kirby's Dream Land contains but honestly, while I was playing it, I did not feel anything was missing. It is a solid, charming, fun little platformer, always was, and always will be, no matter what the franchise would later become. Nice review! I remember my brother getting this game when it came out--I was around maybe 7 or 8 and I loved it. 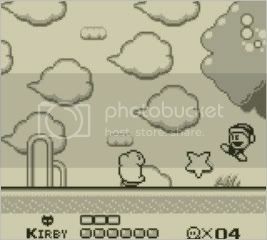 I thought Kirby was a great character and the platforming mechanics sort of blew my mind at the time ("You can FLY!?"). Really the only complaint I can level against KDL--besides its brevity--is that what came after generally redefined the Kirby gameplay. But there's still a lot of fun to be had in the inhale-exhale gameplay, and it makes the bosses a bit more strategic (and requiring more patience) than the later games. My girlfriend grew up playing this game so when I got her Kirby to play on my GBA she was pretty excited. And then she was shocked when she found out you could copy enemy powers. And then I was shocked that she was shocked because I just assumed that any Kirby fan knew all about the power stealing, which is fundamental Kirby to me. I had totally forgotten that you couldn't do this in the first Kirby game. Anyway, I kind of vaguely remember playing this one a tiny bit in the past, but Kirby's Adventure on NES was the first Kirby game that I sat down and played start to finish. I can't say I'm a huge fan of the Kirby platformers, I tend to like Kirby better in the side games like Avalanche and Dream Course, but they're always some fun. I had never played a Kirby game before, but I'm having fun with this one. I think I already beat the second world so I guess I don't have long to go. Yeah, this game is still great despite not having Kirby's trademark copy ability. I remember playing this game back on the old Game Boy, I always found it so soothing, with candy music giving off a true 'dream'-like feeling. It's really a seven point 5 two, the grading system we got isn't flexible enough, however. So, having played every Kirby game except for KDL2 and 3, would you recommend 3? Ah, did you check out the review I linked to? I guess I can sum it up like this: if you want the eye-candy, go for it. But I'd recommend checking a FAQ for the hidden stars to minimize frustration. If you were fine with the slow pace of Crystal Shards, you will likely be okay with the pace of KDL3. Yeah, Crystal Shards' pacing didn't really bother me. It was enjoyable. Fantastic review, Guillaume. Actually, NW has been smoking with good content lately. Everyone's doing great work. I downloaded this on my 3DS. I remember playing this one time back on the Game Boy, but it was just a friend's copy for a little while. Playing it now, it's fascinating to see where the entire Kirby series started from. Kirby's lack of a copy ability restricts the game in a sense (as does his lack of slide and dash, as mentioned in the review), yet the levels are cleverly designed to still pose an interesting challenge. The graphics are actually pretty good; it's obvious Nintendo was getting better at the graphics in this 1992 Game Boy game (same year as Super Mario Land 2). Also, I love hearing these original renditions of the Kirby music that have been used and re-used countless times in the years following. Stage 2 has some cool Kirby music that I do not recognize as much as the other tracks in the game. One thing I appreciate are the mini-encounters with bosses, kind of like a warm up before the battle at the end of the level. It's a cool concept. What the heck is up with the Kirby clones in the boss rush section of the 5th stage? You have to touch the clone to kill off the Gordo blocking the door. And each clone has his own little dance and what not. Weird. I love the shooter level boss encounter (Stage 3), obviously this was duplicated (quite well in fact) in the final boss encounter of the NES Kirby's Adventure. After watching the credits roll, I realize just how faithful the game 'Spring Breeze' is in Kirby Super Star in that it faithfully recreates the original Dream Land, even including the final scene where Kirby becomes a hot air balloon and carries away Dedede's castle, returning the food to his fellow citizens. So after beating the game you get a screen showing you how to enter the code to play Extra Mode (ie Hard Mode). The bosses are now sooo much tougher. All kinds of nasty surprises lie in wait, like the parasols that come flying at you at high speed like homing missiles once Waddle Dee let's go of them! I was so excited to to have finished Extra Mode that I even recorded the special ending where all the enemies are tagged by name. I'm in a Kirby mood, and luckily there are a good number of Kirby games for me to play next. Yes, it is short; and yes, Kirby lacks some of the abilities that would come to define him, but every second spent playing KDL is a fun-filled one. There is always an enemy to kill or a platform to jump on, there is always excitement. The game feels dense. Completely agree with you on this, Gui. After I complete modern Kirby games, I often challenge myself to play through them as "original Kirby," denying myself his copy ability. It's a fun personal challenge. 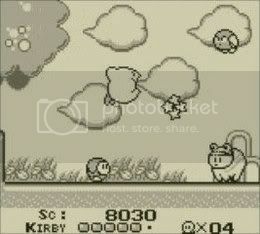 Kirby's Dream Land was one of my favourite original Game Boy games, and still is! Hey cool, I've never tried that, it does sound like a fun challenge!